Bread pudding is an easy to make, comfort food kind of dessert that is always a good choice on a cool day. The dish is basically just bread cubes soaked in a sweetened mixture of milk and eggs, then baked – not entirely unlike like a big dish of french toast, although it is usually served for dessert, not breakfast. The best thing about bread pudding is that it is very easy to create flavor variations on the recipe so you will never tire of having it for a treat. 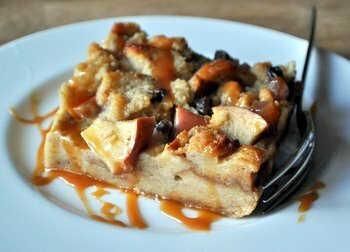 This time around, I wanted to give my bread pudding a warm winter flavor by incorporating apples, apple cider, brown sugar and spices. I used fuji apples in this recipe. You can really use any kind of apple, although I wouldn’t recommend using something like red delicious, as they tend to turn mealy when baked. The dish isn’t too sweet, but if you like a tart apple flavor in general, use Granny Smith apples, or something similar. The overall flavor comes from the combination of spices – cinnamon, allspice, nutmeg and a hint of cardamom – and the cider, not just from the apples themselves. That said, having chunks of apple studding your bread pudding gives it more of a fresh apple pie feeling than a bread pudding made without them. It is not necessary to peel the apples, but you can if you wish to. I also added some raisins, for additional sweetness, and you can certainly throw in a half cup of chopped walnuts or pecans if you want a bit of crunch, too. The finished bread pudding is very tasty. It’s not too sweet and all of the flavors that go into it come out nicely in the finished product. It’s at its very best when fresh and still slightly warm from the oven, but this dish can also be served chilled or at room temperature. Dress it up with a drizzle of caramel sauce or a small scoop of ice cream if you’re feeling a little adventurous. In a very large bowl, combine bread cubes, apple cubes and raisins. In another large bowl, whisk together eggs, sugar and all spices until well combined. Wish in milk and apple cider, then pour mixture over the bread cubes. Toss gently with a spatula until cubes are evenly coated. Let stand for 15 minutes. Pour mixture into prepared pan and smooth into an even layer. Bake for about 50 minutes, until bread pudding is puffed and lightly browned, and a knife inserted near the center comes out clean. Cool for at least 15 minutes (pudding will sink slightly) before serving. Store leftovers covered, in the refrigerator. Yum! I just pulled pumpkin bread pudding out of the oven. Now I wish I had put apples in it! 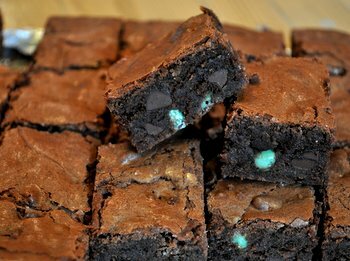 Oh this looks so yummy!! I can’t wait to try it. I love bread pudding. 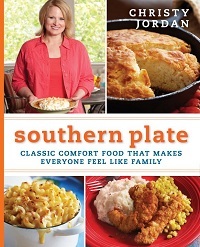 You are right about it being a comfort food. Love almost anything apple – especially cider! This looks like it just oozes goodness. I have never been able to get the right texture when I make bread pudding but I like the looks of yours. 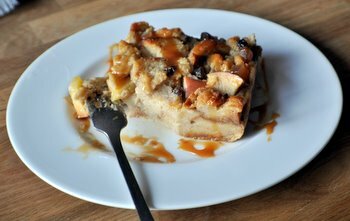 I just tried bread pudding for the first time last year, and now I love it! This look like a delightful dessert! I love bread pudding, but I’ve never made it. This looks great! My hubby loves bread pudding for breakfast, and I quite often make it with apples and nuts, but have never incorporated the cider, which sounds like a wonderful addition. I’m not a regular reader but found your blog via search for “bread pudding not too sweet.” I made yours, decreasing the sugar to 10 Tablespoons and also using hard cider (definitely NOT sweet) instead of the cider called for. Still too sweet for me! But I’ll save the recipe, which I think is basically a good one (love the addition of fresh chopped apple! ), and next time try cutting sugar flat in half. Thanks!